Andy is an elegant and stylish onepage PSD with a focus on clean, subtle design elements. Perfectly suits for photographers, freelancers, design agencies, creative persons and for landing pages as well. Andy packed with dark and light versions of the homepage, single work preview, blog page and shortcodes page. The PSD consists of well-organized components – so it’s easy to modify and customize everything. If you have any questions, feel free to post a comment. Stand out of the crowd with this great and creative solution. Try it now! 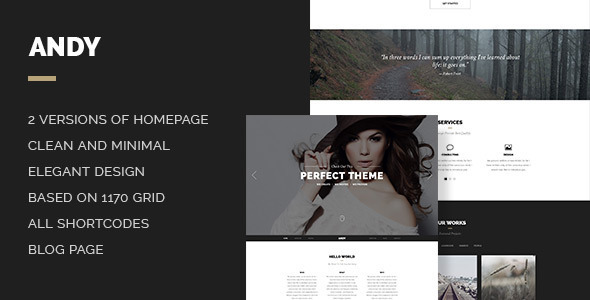 » Fluidly - A multi-purpose showcase theme.